Directive 2006/42/EC is a revised version of the Machinery Directive, the first version of which was adopted in 1989. The new Machinery Directive has been applicable since 29th December 2009. The Directive has the dual aim of harmonising the health and safety requirements applicable to machinery on the basis of a high level of protection of health and safety, while ensuring the free circulation of machinery on the EU market. The revised Machinery Directive does not introduce radical changes compared with the previous versions. It clarifies and consolidates the provisions of the Directive with the aim of improving its practical application. While the revised Machinery Directive was being discussed by the Council and the European Parliament, the Commission agreed to prepare a new Guide to its application. The purpose of the Guide is to provide explanations of the concepts and requirements of Directive 2006/42/EC in order to ensure uniform interpretation and application throughout the EU. The Guide also provides information about other related EU legislation. It is addressed to all of the parties involved in applying the Machinery Directive, including machinery manufacturers, importers and distributors, Notified Bodies, standardisers, occupational health and safety and consumer protection agencies and officials of the relevant national administrations and market surveillance authorities. It may also be of interest to lawyers and to students of EU law in the fields of the internal market, occupational health and safety and consumer protection. It should be stressed that only the Machinery Directive and the texts implementing its provisions into national law are legally binding. The 2nd Edition of the Guide was endorsed by the Machinery Committee on 2 June 2010. In comparison with the 1st Edition, it was completed with comments on Annexes III to XI of the Machinery Directive. Some errors noticed by readers have been corrected. Legal references and terms have been updated in line with the Lisbon Treaty - in particular, where the Directive refers to 'the Community', the Guide now refers to 'the EU'. Following discussion with the industry, the comments relating to chains, ropes and webbing for lifting purposes in §44, §330, §340, §341, and §357 have been revised in order to clarify the practical application of the requirements relating to these products. The 2nd Edition also includes a thematic index to facilitate consultation of the Guide. The numbering of the sections of the Guide is unchanged. 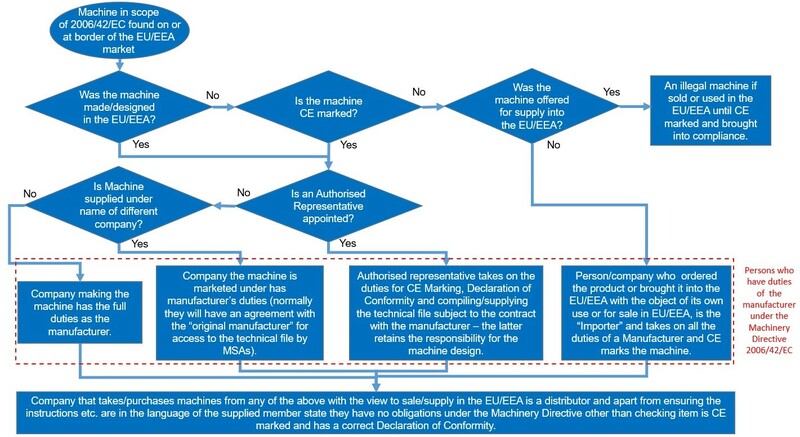 The Guide takes account of the amendment to Directive 2006/42/EC introduced by Regulation (EC) No 569/2009 relating to the regulatory procedure with scrutiny for the Machinery Committee. It also takes account of the provisions of Regulation (EC) No 765/2008 relating to market surveillance, which apply in a complementary way. This Update to the 2nd Edition of the Guide, further named Edition 2.1, has been completed to include the amendments made to the Machinery Directive by the Directive 2009/127/EC on Pesticide Equipment and the Regulation (EU) No 167/2013 on the approval and market surveillance of agricultural and forestry vehicles (Tractors). In addition, guidance on “partly completed machinery” and “assemblies” has been added, as well as inserting clarifications and corrections to the concepts of "safety components'', "new and used machinery", "marking of machinery". A number of key guidance decisions of the Machinery Working Group have been incorporated into this text. The Guide is published on the Commission’s Website EUROPA in English. This updated Edition 2.1 is intended to be a living document, edited and updated with new guidance once approved by the Machinery Working Group. It will be made available in other EU languages, but only the English version will be checked by the Commission. Therefore, in case of doubt, the English version should be taken as the reference. The Guide can be downloaded and is presented in a printable format. The text of the Directive is presented in boxed red italic type - the comments follow in black type. The Guide has been prepared with the help of an Editorial Group and this Update of the 2nd Edition has been carried out by an external consultant and the Commission, assisted by some of the members of the Editorial Group. The Commission wishes to warmly thank the members of the Editorial Group both for the huge amount of work they have carried out as well as for the efficient, constructive and cooperative spirit in which the drafts have been prepared. In parallel to the work of the Editorial Group, a Machinery Core Group established by Orgalime, including representatives of the main sectors of machinery manufacturing, has provided invaluable input from the industry. The drafts prepared by the Editorial Group have been submitted to the Member States and stakeholders for comments. The Commission would also like to thank all those who have made comments. We have tried to take them into account as far as possible. Of course, the Commission takes full responsibility for the content of the Guide. Readers are invited to communicate any corrections or comments so that they can be taken into account in preparing future updates or a revised 3rd Edition. 1.7.3 – 1st & 2nd paras. 2.4.10 §290 Instructions on precautions, use, inspections, calibration, maintenance etc. 3.3 - 2nd, 3rd & 4th paras. 3.3.1 – 4th & 5th para. 3.3.2 – 2nd, 3rd & 4th para. 3.3.3 – 1st, 2nd & 3rd para. 6.3.2 – 2nd & 3rd para. Dutrieux, Pascal Etienne, Ludwig Finkeldei, Gun Fridfelt, Mikael Holst, Tuiri Kerttula, Andreas Kühn, Thomas Kraus, Patrick Kurtz, Kevin Lane, Leila Martin, Wolfgang Lentsch, Göran Lundmark, Thomas Moessner, Anders Mortensen, Phil Papard, Boguslaw Piasecki, Marc Schulze, Katri Tytykoski, Roger Upfold, Wendy Van Aerschot, Gustaaf Vandegaer, Henk van Eeden, Richard Wilson, Jürg Zwicky. The Commission representatives: Ian Fraser (until 2013), Felicia Stoica, Mario Gabrielli Cossellu. Corrections, comments and suggestions for improvement should be addressed to the functional e-mail box: GROW-MACHINERY@ec.europa.eu.